Indian bowler Bhuvneshwar Kumar (L) celebrates after taking the wicket of Colin Munro (R) of New Zealand during the second one-day international at the Maharashtra Cricket Association Stadium in Pune on October 25, 2017. PUNE (INDIA) - Fast bowler Bhuvneshwar Kumar claimed three wickets as India restricted New Zealand to 230-9 after a pitch-tampering controversy threatened to disrupt the second one-day international in Pune on Wednesday. International Cricket Council officials gave the match the last-minute go-ahead after India's ruling body sacked a groundsman, following an undercover sting by journalists in which he claimed to have doctored the pitch before the game. The Board of Control for Cricket in India (BCCI) dismissed Pandurang Salgaoncar, the pitch manager at the Pune ground, after he described to India Today TV reporters, who were posing as bookies, how he had tampered with the pitch. Another curator was swiftly drafted in before match referee Chris Broad inspected the pitch and cleared the game to start, with New Zealand captain Kane Williamson winning the toss and choosing to bat first. India, who must win the ODI to keep the three-match series alive, quickly put New Zealand on the back foot, skittling through the visitors' top order to leave them reeling on 27-3 after seven overs. Martin Guptill was the first to go, for just 11, when wicketkeeper Mahendra Singh Dhoni caught him off Kumar. Williamson could only manage three before being out lbw by paceman Jasprit Bumrah. Kumar claimed his second wicket not long afterwards when a teasing slow delivery had Colin Munro bowled for 10. Ross Taylor made 21 before Tom Latham (38), top scorer Henry Nicholls (42) and Colin de Grandhomme (41) stopped the rot. Kumar clean-bowled Nicholls for his third wicket while Bumrah celebrated his second when Indian captain Virat Kohli caught Mitchell Santner near the boundary on 29. Spinner Yuzvendra Chahal chipped in with two wickets of his own, dismissing de Grandhomme and Adam Milne (0) in successive balls. New Zealand won the opening ODI by six wickets in Mumbai on Sunday. 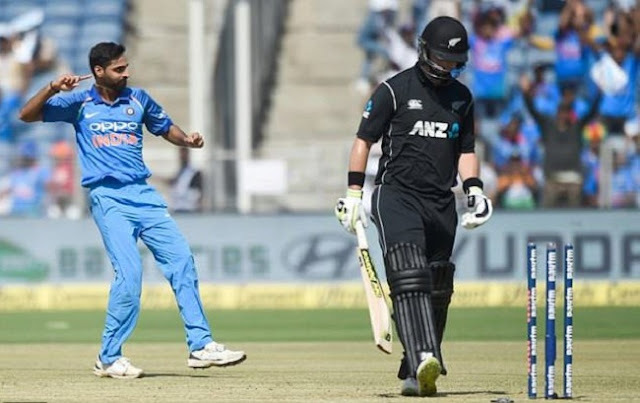 Fast bowler Bhuvneshwar Kumar claimed three wickets as India restricted New Zealand to 230-9 after a pitch-tampering controversy threatened to disrupt the second one-day international in Pune on Wednesday. International Cricket Council officials gave the match the last-minute go-ahead after India's ruling body sacked a groundsman, following an undercover sting by journalists in which he claimed to have doctored the pitch before the game.